Register for Early Bird Registration to my upcoming classes with the sign-up box below. I love to teach. To date, I have taught over 700 students at my workshops, private lessons, and lectures around the United States and Europe. My classes are usually small, emphasizing focused, individual attention. All my workshops are hands-on using traditional materials. Students receive a beautifully-packaged deluxe supply kit and my very own letter guide booklet. Absolutely no previous calligraphy experience is required. I cover all the basics of modern script calligraphy, from holding the pen to writing the complete lowercase alphabet. 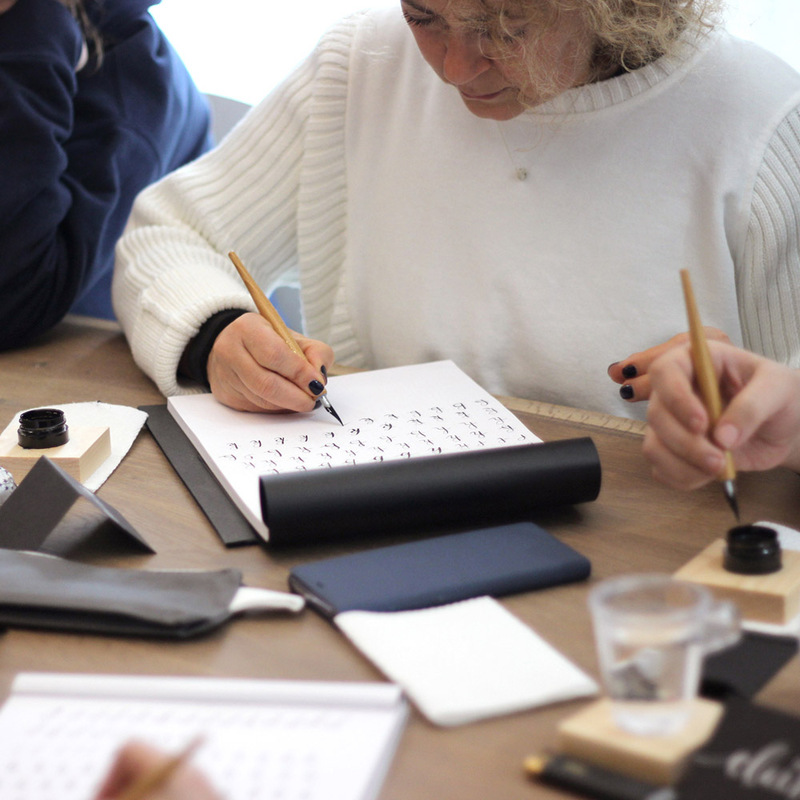 Whether you will be picking up a calligraphy pen for the very first time or are seeking hands-on instruction to enhance your existing, beginner-level calligraphy skills, this class is right for you! Whether you've taught yourself or learned from a teacher, if you can hold a calligraphy pen and write full words then this class is right for you. You do not need to have years of experience. This class covers some of modern calligraphy's most fun, popular techniques with emphasis placed on connecting letters, plotting layouts, and playing with letterforms. I can adapt my teaching to large or small groups but always emphasize giving lots of individual attention. If you're interested in having me come to your school, your conference, your shop, or anywhere else, please contact me – I love to travel! I have also been a guest lecturer on graphic design and its intersection with hand lettering at The University of Southern California’s Roski School of Fine Arts and The University of California at Los Angeles’s Design Communication Arts department. “I traveled halfway across the country to take a beginner workshop from Molly and I would do it again in a heartbeat. Molly was a wonderful, encouraging teacher, and offered so many materials and helpful tips." 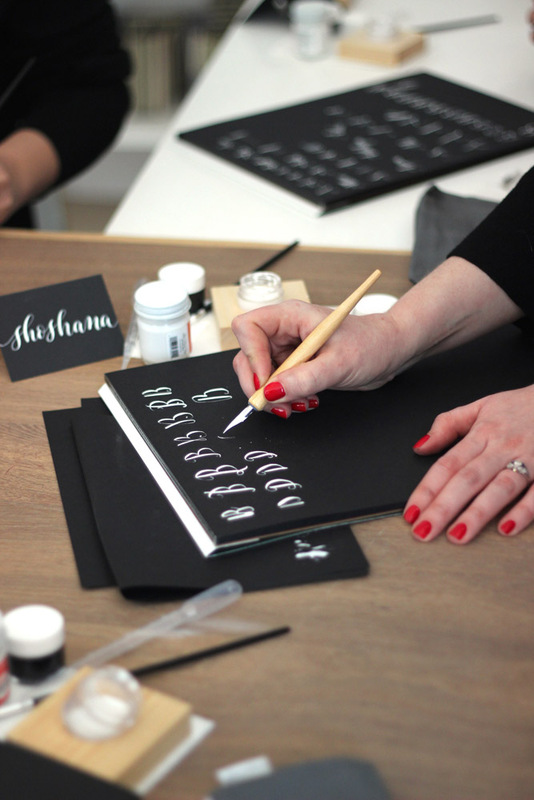 "There is absolutely no substitute for the instruction and hands-on practice in Molly's calligraphy classes. I took both the Beginner and Early Intermediate classes, which were small and set in a cozy Cambridge, MA studio. In both classes, Molly shared her calligraphy wisdom and experience, patiently watched each of us practice our lettering, and provided invaluable feedback on our technique.